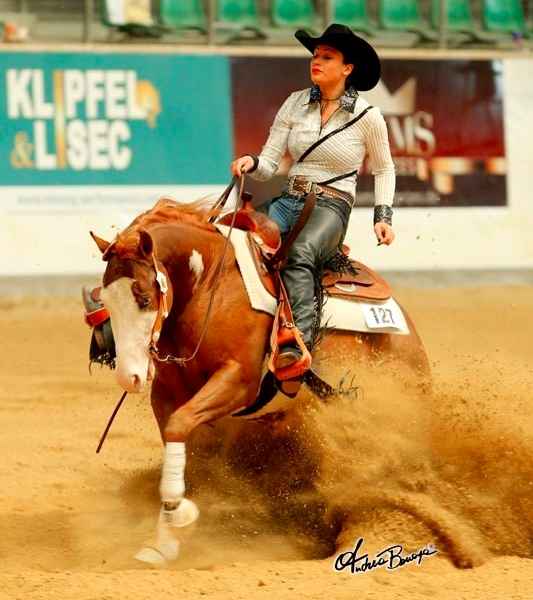 For Immediate Release – Kreuth, Germany – March 30, 2014 – By Simona Diale – The first section of the first go-round of the National Reining Horse Association (NRHA) European Open Futurity offering the €92.000-added level (L) 4, €35.000-added L 3, the €15.000-added or more L 2 and the €7.500-added or more L 1 opened the sixth edition of the European Futurity in Kreuth, Germany today. Leading the L 4 and the L 3 open divisions with a 219.5 was Nina Lill of Germany riding Forevergun (One Gun x ES Sweet Little Star x RR Star), bred and nominated by Alice Marinoni. The American Paint Horse stallion is owned by Franz Jaksche. Tying to lead the L 2 division with a 214, were Andrea Mannucci of Italy riding Ruf Little Chex (Lil Ruf Trouble x Nu Dynamite Chex x Nu Chex To Cash) for owner Ferrucci Bucci and fellow Italian trainer, Andrea Bonadomane, riding ARC Topsail Walla (Walla Walla Whiz x Diamonds Ms Topsail x Topsail Cody) owned by Astrid Eisendle. Bonadone and his mount also lead the L 1 division with a 214. 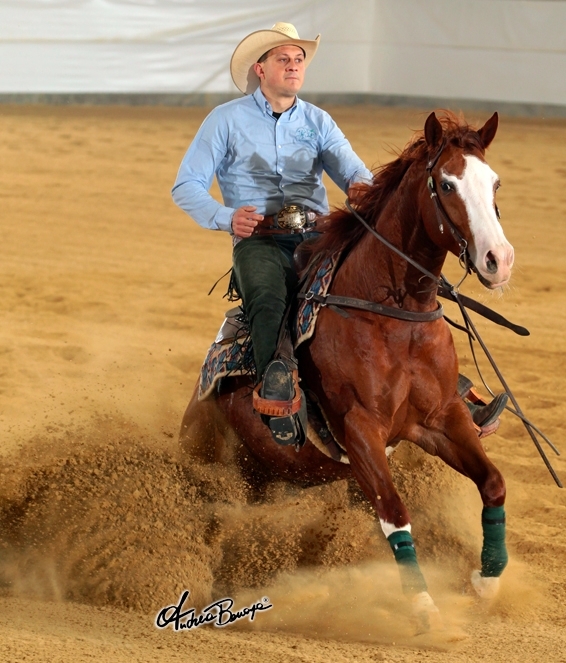 Ruf Little Chex, an American Quarter Horse gelding, was bred by bred by Roger Weibel and nominated by Luigi Parise. ARC Topsail Walla was bred by Paola Arcese and nominated by Luga Quarter Horses. Tomorrow morning at 8 a.m., the second section of the Open Futurity qualifying go-round will be held. The KL Performance Horses Non Pro Futurity will offer the €36.000-added L 4, the €11.000-added or more L 3, the €6.400 or more L 2 and the €3.200 or more L 1. The qualifying go-round will be held tomorrow following the second section of the Open Futurity go-round. 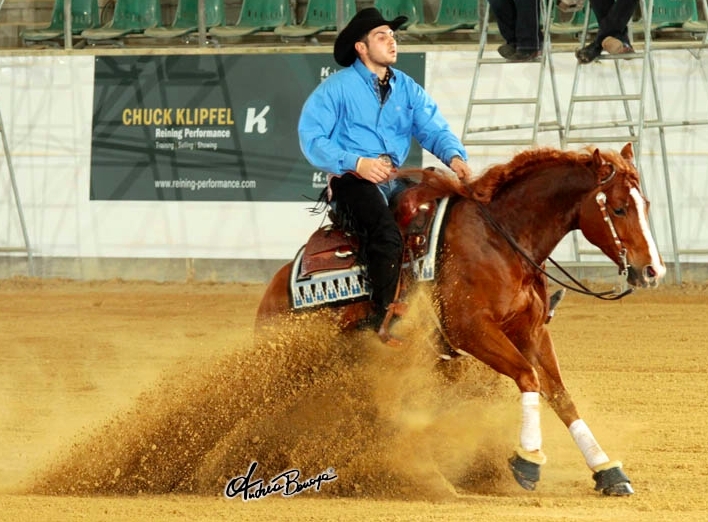 Open to 4-year-old horses, nominated in the NRHA European Nomination Program, both the Open Futurity and the KL Performance Horses Non Pro Futurity are run in a qualifying go-round and clean-slate finals. The NRHA European Futurity also offers a full-slate of NRHA ancillary classes including these the €10.000-added Open and the Arcese €5.000-added Non Pro. Riders were welcomed this morning by the NRHA Judges Monitor for the show, Ollie Griffith, and by Karen McQuiston, chair of the NRHA Stewards Committee. For further information, visit the official website: www.nrhaeuropeanfuturity.com.